DES MOINES -- It cannot be a good sign for Newt Gingrich that I was one of only two reporters trying to slip into his second event this morning, a closed-door fundraiser for the Senate Majority Fund, an organization intent on reclaiming the Iowa Senate for Republicans. 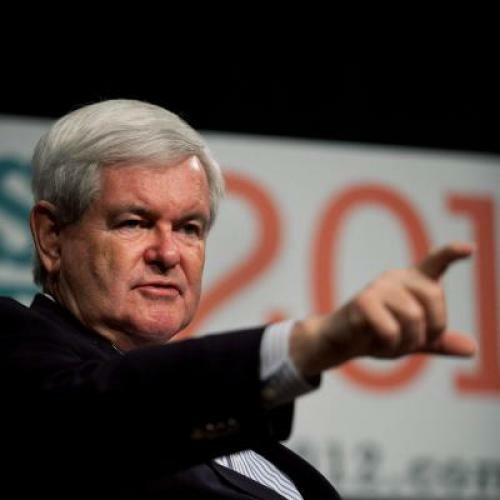 An aide came over to check on my credentials and I mumbled a response, but was allowed to stay -- it's gotten to that point for Newt where nothing really matters that much anymore. The polls have him fighting for fourth place; a new tally shows that 45 percent of the ads on Iowa airwaves have been attacking him. Newt was no less grandiose at his first event of the morning, a better-attended Rotary breakfast that started before daybreak. It's one thing to see him waxing world-historic standing behind a lectern at TV debates; it's another thing to see him doing it in more humble settings with regular folks sitting before him and a table of scones in the background. For starters, Gingrich is apparently able to bring back the dead so they can run with him on a political ticket, based on this pitch: "Reagan and Gingrich are for lower taxes, Obama's for higher taxes. Reagan and Gingrich are for less regulation, Obama's for more regulation. Reagan and Gingrich are for American energy, Obama is against American energy..."
In his closing at the breakfast, Gingrich presents voters with a stark challenge: vote for me, or accept the end of America as we know it. "If what you want is a president who's going to allow you to relax, go home, not worry about it, Washington will be fine, everybody will take care of each other, we'll all be equal, I'm the wrong guy. The scale of change we need is going to make Republicans uncomfortable, it's going to make Democrats uncomfortable, it's going to make the House uncomfortable, it's going to make the Senate uncomfortable, it's going to make the bureaucrats uncomfortable. And you have a simple decision. If you think that level of change is too much, then we need to accept decline and decay, because that's what we're going to get." On his way out of the second event, I asked Newt whether his ideas were just too big for the political system he is now campaigning in. He demurred. "Ask me Tuesday night. No one knows much, if these polls mean anything." But the thought lingers. Maybe his problem is that the office he's running for is too constricted to embrace what he is talking about. Maybe what he is envisioning is someone who can tie it all together -- Brazilian sugar crops, turbines in the North Sea, Hong Kong tax rates. Yes, maybe what he is actually meant to be is king of the world.